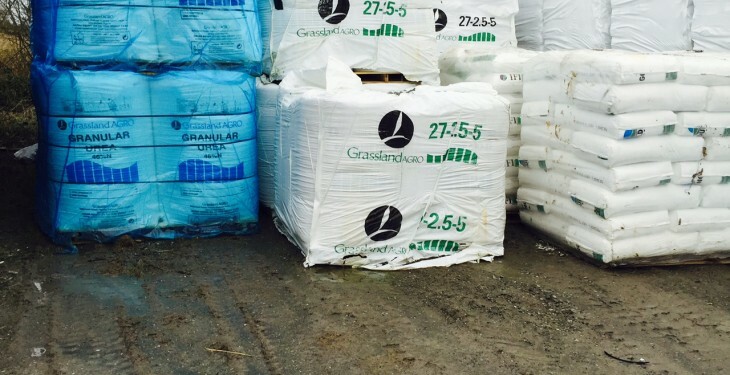 Fertilisers account for more of Irish farmers spend on inputs than any other farmers in EU Member States, according to latest research commissioned by the European Parliment. The research used FADN data to assess the relative importance of the consumption of fertilisers for European farmers. The average cost shares of fertilisers by Member State, for the periods 1989–2009 and 2004–2012 are reported in the diagram below. 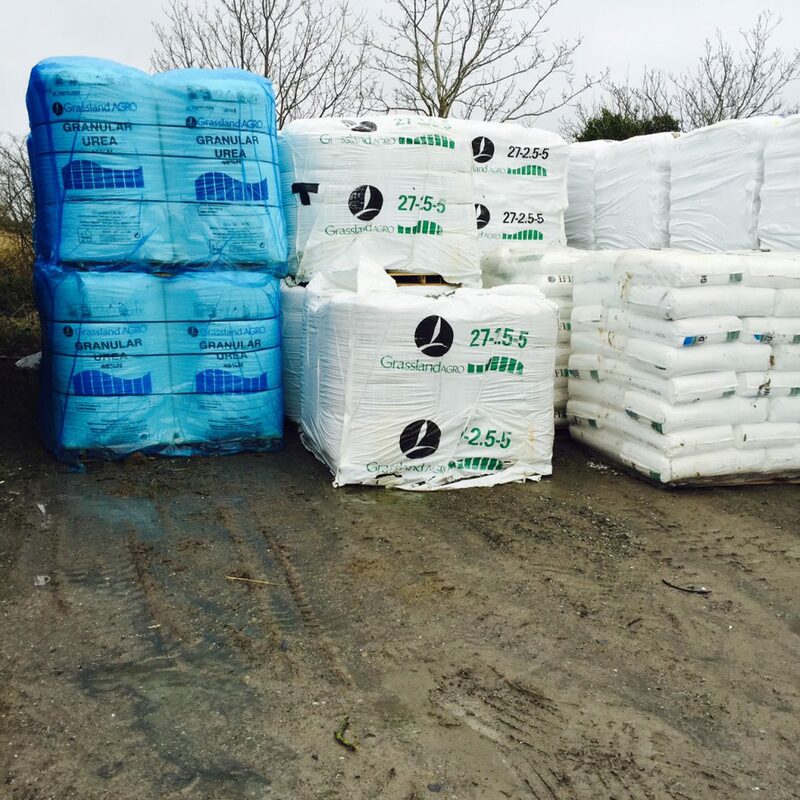 The values show fertilisers reaching an incidence on farming costs as high as 20% in Ireland and as low as 3.6% in Malta. 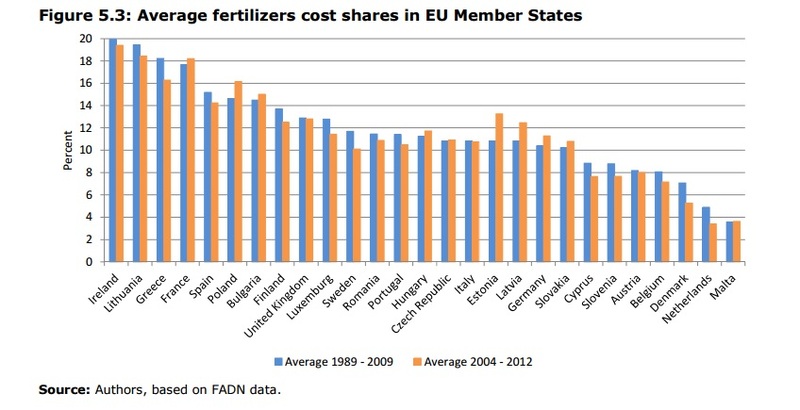 In spite of the data not showing any clear patterns across states, for the majority of EU15 Member States (with the exception of France and Germany), the cost shares of fertilisers appear declining, with a decrease as large as 44% for The Netherlands (from 4.9% to 3.4%) and -34.4% for Denmark (from 7.1% to 5.3%). The opposite emerges for the PEMS (with the exception of Cyprus, Slovenia, Romania, and Lithuania) showing an increasing cost share of fertilisers, the largest (in relative terms) that of Latvia (+13.1%, from 10.8% to 12.5%) and Estonia (+18.2%, from 10.8% to 13.3%). 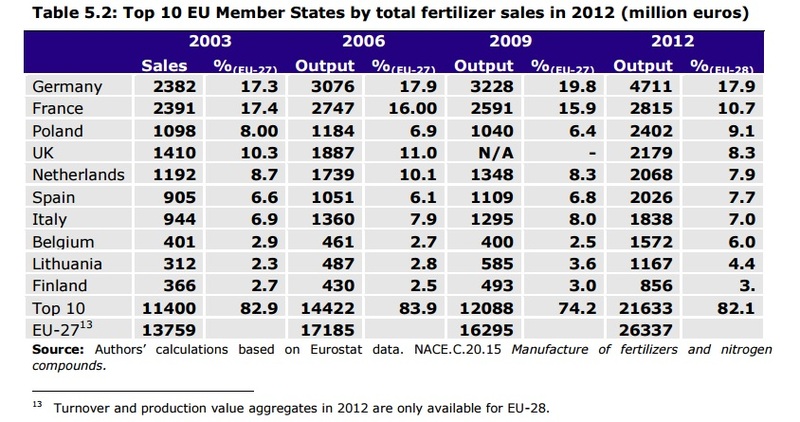 Consumption of fertilisers has been declining in the EU27; the decline in consumption of N-based products is less marked than for K and P.
Differences in relative usage of the three types of fertilisers (N, K, and P) can be found across geographic areas, with Mediterranean areas showing less consumption of N- based products and higher consumption of P based products than other countries. The share of fertilisers costs over total specific cost has followed a positive but declining trend over time. Among the EU15, the share of soil improvers increased in the previous decades to decline in the recent years; among PEMS, one can observe a growing and increasing cost share of fertilizers. The total value of sales of fertilisers’ company operating in EU Member States has increased in the period 2003-2012, recovering from the sharp decline marking the years of the economic recession. 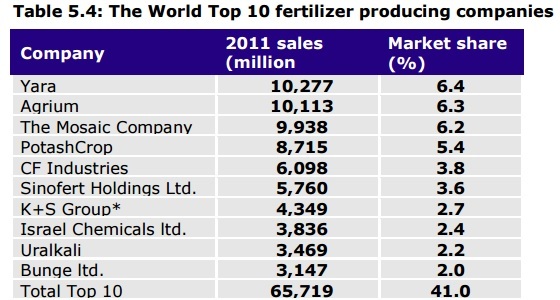 The number of enterprises producing fertilisers and soil improvers has increased in the period 2003-2012. Germany, France, Poland, the UK, and The Netherlands are the countries with the largest values of fertiliser sold, accounting for more than 50% of the total fertiliser turnover realised in the EU27. The European fertiliser industry appears only moderately concentrated with an estimated range of the CR5 spanning from 22.23% to 29.48%, and simulated HHIs that vary between 205 and 302. Firms in the European fertiliser industry appear actively engaged in operations of mergers and acquisition.